Growing anything is difficult. To be a farmer you have to do a lot of work. To be a good farmer you have to know a lot before you do all that work. To be an effective farmer you could really use a PhD. in agronomy, an MBA, some experience in cartography, and another degree in meteorology. People who farm for a living usually spend their time doing just that, farming. They spend their time planting, applying pesticides, herbicides, fungicides and fertilizers, building and repairing fences, troubleshooting problems like floods, droughts, theft and equipment breakdown, harvesting, and getting that harvest to a buyer. Because all this constitutes a more than full time job, most Latin American farmers don’t spend time studying the chemistry of fertilizers, the biology of plants, the fluctuations of commodities markets, or the patterns of air currents. To be an effective farmer, one who makes good- not necessarily the best, just good- use of resources like time, manpower, and land, you need a lot of information. Farmers get their information many of different ways; Latin American coffee farmers get their information from what they’ve seen their families do in the past, what they hear from middlemen and the people/companies who buy their crop, agrochemical companies, general news sources, and by word of mouth. Federico (and his brothers and his neighbors) couldn’t rely on what they’d learned from their parents, because no one in their area had farmed coffee before. They had partial view of the crop because many of them had worked as pickers at farms in other areas of Panama, or knew people who’d worked as pickers. They saw other people doing it, and they decided to do it too. But they did it without all the necessary information. Only about 5-8 years after they planted their coffee the production started to drop, and the people they used to sell to stopped bothering to come all the way up the mountain to buy their coffee. So they started devoting more of their time back to subsistence farming. His trees are old enough and haven’t produced in long enough that the pruning probably won’t make a difference and he’ll probably never see a return in production. Unfortunately, his spindly and leafless trees didn’t look too hopeful. But who knows, plants are surprisingly resilient. It was tough to explain to him that pruning in and of it self is not an instant fix, that it has to be timed and coupled with regular applications of fertilizer, regulated shade, and even more regulated weed control. It’s probably too little too late. Information is only as good as its timing. To coffee merchants, this is known as the all too familiar “coffee cycle,” where, when prices are high, lots of farmers run out and plant lots of coffee, and when those hastily planted trees start producing- around 3 years later- the market is flooded and the price plummets. Farmers realize they won’t make any money and rip up their trees. The market responds to the decrease in supply, the price goes up, and the whole thing starts all over again. 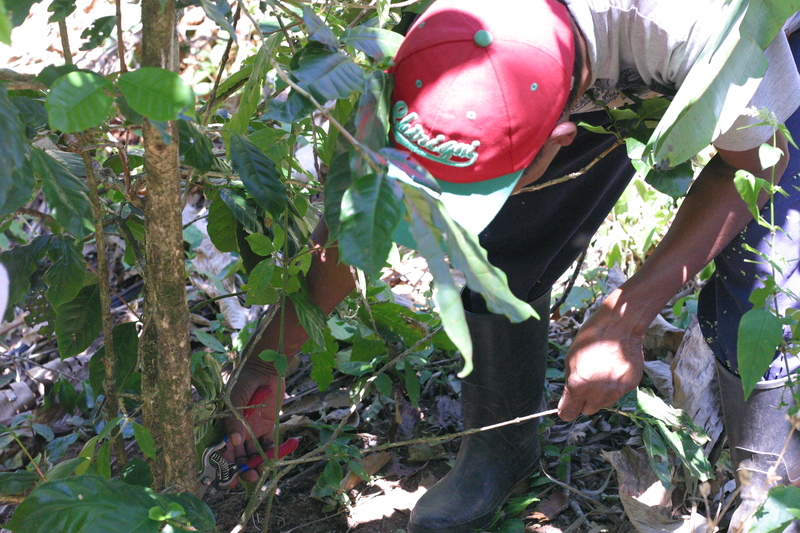 Gossip, hearsay, guesswork, and the good old grape vine dominate a good portion of coffee farming. Landowners make the decisions about what to plant- and then how to manage it and sell it- based on what they hear from a host of sources: informed or not. Panamanians hear on the radio, see on TV, and read in the papers that people as far away as Japan are enamored with Panamanian geisha coffee. So seasonal pickers steal a few geisha seeds, plant them on their farms, and pull their hair out trying to make it grow. No one told them that geisha won’t grow in sun drenched fields at elevations of 300 meters. And they had no one to ask. In Costa Rica there is an almost 200 year old culture around cultivating the crop, so some farm practices are considered common knowledge and part of the larger caficultor coffee culture. (Of course Arabica coffees demand high elevations. You only see fincas in the higher regions of the country. Of course you have to prune your trees. Little kids grow up seeing mountainsides of pruned trees, teenagers grow up helping their dads prune, landowners consider deciding when to prune as one of their basic responsibilities). Panama’s coffee growing culture may not be as codified as that of Costa Rica, but in both countries any community or family growing coffee for the first time has to piece together information from somewhere about how to do it. There are countless iterations of coffee growing guides that exist, but you have to know they exist in order to look for them, and you have to have solid reading skills to understand them if you get one. This is where organizations like cooperatives make huge advances in funneling information to growers; the coop can hire someone to do the agronomical and entrepreneurial information heavy lifting and then pass it down- in a comfortably condensed useful form- to its members. But long time coop members are the ones going rogue and starting their own micromills and affecting direct trade deals precisely because they feel like they can get better information, mostly about pricing, and therefore better profit if they take matters back into their own hands. Growing things is hard enough, but it seems like getting information about how to grow them effectively and then be justly compensated for all that hard work might be even more difficult. The primary source of information for farmers is still what wriggles through the grapevine. If a farmer hears that someone else is making money doing something, his first question is always, “why am I not doing that too?” So far I’ve seen just as many abandoned coffee farms as producing ones. The grapevine doesn’t always deliver. Growing things is a slow, tedious process, but to make all that slow tediousness worthwhile, a just as slow and tedious process of piecing together information needs to take place before anyone touches the ground. But no one tells coffee farmers that. And they have no one to ask.